When I think of my last Shavuot of rabbinical school, all I can remember are glimpses. Like the slide shows that I remember my parents used to project on the dining room wall. Most of my memories of my son's first year of life are like that. They're a punctive story told through images. He didn't sleep through the night until he was well over a year old, so my memories of that first year are spotty. The visuals are points on a line that don't quite add up to a whole. When I try to call up the slideshow of those Shavuot memories, I see the square of light that used to shine when the carousel was first turned on, and then I see disconnected moments. Click: trying to get my kid to sleep in the portacrib in the closet area of my room at Isabella Freedman. Click: walking with the stroller in the middle of the night to the great hall, because if my kid wasn't going to sleep, then by God I wasn't going to miss Reb Zalman's 4am teaching. Click: pushing the stroller in circles around the back of that room while I listened to the rebbe teach. He taught about the Torah of our mothers. Click: morning davening, singing in harmony with beloved friends. (Have I ever known a more fervent form of prayer than singing in harmony?) Click: morning davening, leaving the room so I could nurse my son in private on the other side of the wall. Nursing him while still immersed in the sounds of the community singing. My son and me: Shavuot, Isabella Freedman, 2010. My son was six months old then. We had survived colic and postpartum depression. Sleep was still hard to come by. When I went to Isabella Freedman for Shavuot that year, I packed the "bouncy seat," the little inclined chair that played music and vibrated gently. I carried it with me. On the second morning of Shavuot I parked him in that seat so I could try to daven my way wholly through shacharit for the first time since he was born. It was harder than I expected. The year I took my infant son to Shavuot at Isabella Freedman, I knew that I would someday tell him that over the first Shavuot of his life I took him to hear my rebbe teach, and to receive a blessing from the teacher of my teachers. I wish I could remember the blessing that Reb Zalman gave him. I was still so sleep-deprived that my brain wasn't forming longterm memories, and I didn't know then that if I didn't write it down immediately it would become lost to me. My son and me, a few days ago. Parenthood has given me new ways to understand the idea that God is constantly revealing Torah. The Kotzker Rebbe taught that Shavuot is called the day of the receiving of the Torah, not the day of its giving, because God is always giving. Shavuot is when we notice the gift that we receive. Parenthood too is an adventure of always-receiving, though I'm not always mindful of the Torah that's coming through. I forget, lose track, and get caught up in ordinary life's minutiae. And then every now and again I wake up again to the reminder that I can learn from the Torah of every human being I meet, including and especially the tall funny cuddly seven-year-old human being who is in my care and keeping. I'm grateful for what he teaches me about finding God in the presence of change. One of our tradition's names for God is Ehyeh Asher Ehyeh, "I Am Becoming Who I Am Becoming." Parenthood is an amazing reminder that in change, we glimpse God. The summer I was fifteen, I spent a month as an exchange student in a small city in Brittany. The city was called Lannion, and it was adjacent to Perros-Guirec, which was the hometown of my middle school French teacher. Each summer he took a handful of his students back to his birthplace. In retrospect, now that I have a child and live a few thousand miles away from my parents, I imagine he must have started organizing the homestays in order to help him afford to bring his kids back home. I grew up in south-central Texas, where summers last a long time, and they're hot: really hot. (I couldn't quite fathom it when I was instructed to pack some things with long sleeves.) The beaches I knew were those at Port Aransas and South Padre Island, on the Gulf coast, where the water is warm. And the flora I knew was the stuff that grows at the intersection of subtropical and scrub desert -- very Mediterranean. I grew up with banana trees, bougainvillea, oleander, prickly pear cactus, magnolia. Living in France was an amazing adventure. I remember dinners outside in the long light evenings -- and foods I had never before seen: langoustines, raclettes, buckwheat galettes. I remember the dolmens, erected four or five thousand years ago and weathered by rain and salt air. I remember side trips to Mont St.-Michel with its extraordinary tides, and to Rennes to visit my host family's family. I remember going to the beach. I was determined to swim in the English Channel, even if it were cold! And I remember noticing that plants grew in Brittany which I had never before seen. I was especially struck by the lush bushes covered with giant flowers made up of many tiny blooms. I asked my host mother what they were called, and she told me hortensias. Some years later I visited the island of Nantucket for the first time with the family who would become my in-laws, and there I saw the same beautiful clusters of blossoms again, and learned their common English name, which is hydrangea. Hydrangeas grow all over coastal New England. They grow in our backyard now, too -- though in our backyard their blooms are a simple ivory-white. In more acidic soils, like the seaside soil of Lannion (or, for that matter, the seaside soil of Nantucket and Cape Cod), the blooms are blue: ranging from periwinkle, to pale lavender, to a deep purple-blue. They're a kind of natural litmus paper. And every time I see them, I remember for an instant what it was like to be fifteen on my homestay in Lannion. In the summer of 1989, I spent five weeks traveling the American West with a group called Man and His Land. The trip offered opportunities to taste a variety of different wilderness experiences: backpacking and canoeing in Yellowstone, a river-rafting trip in Utah, horseback riding and llama trekking and mountain biking in Wyoming, culminating in learning how to do some technical climbing in the Grand Tetons. We caravaned in a pair of big vans when we had to move from state to state. In retrospect, I cannot imagine what moved me to do this. I had never been an athletic kid. I always chose books or art or theatre over outdoor activities or sports. What on earth made me think that Man and His Land was a good idea? (Actually, I think I know part of the answer to that -- it was my friend Milly, who went with me. I think it was probably her idea. But I agreed to it all the same.) Of course, it was a great idea. Even bookish kids can fall in love with the great outdoors, and the trip was designed to be a supportive environment for kids to stretch themselves and find their wings. But it was hard. I grew up in south Texas, and had been to New Mexico, so the vistas of the American West weren't as mindblowing to me as they were for some of the kids who came from more eastern or more urban locales. But I'd never experienced backcountry camping -- the kind of camping where you hike for miles into the wilderness, and carry everything in and out. I was not in good shape (although at least I wasn't struggling to shake a cigarette habit like some of the other teens) and I huffed and puffed my way up every mountain. MHL asked me to do things I didn't think I could do. Somehow, I did them. 1989 was smack in the middle of the era of the mix-tape. And our trip leader -- a woman named Barb, whom I idolized; she seemed to me impossibly wise, at the advanced age of twenty-eight -- made use of a mix tape in a powerful way. Before each segment of the trip, she would gather us around the campfire and play a little bit of the tape. The trip began with a Cat Stevens anthem: "On the Road to Find Out." Before our warm-up hike in the Great Sand Dunes National Park at the edge of the Sangre de Cristo mountains, she played us Carole King's "I Feel The Earth Move Under My Feet." Before we went backpacking in Yellowstone, we heard Jimmy Cliff's "You Can Get It If You Really Want." Before our river rafting expedition, Loggins and Messina's "Watching the River Run." The songs pervaded and permeated our time in the wilderness in a way that wouldn't be possible now in the era of phones which double as mp3 players. It's probably unimaginable to today's teenagers to be away from their music; music lives on their phones, music lives in the cloud! But none of that was true the summer that I was fourteen. That mix tape was the complete soundtrack of that summer. I don't consciously think about Man and His Land much. But the songs from that mixtape are still with me. Often I find the melodies and lyrics in my head, and only then do I realize what current emotional or spiritual situation has called them forth. Most of these are songs I haven't heard in decades, but they're inscribed deep in my memory. Probably the one which most frequently arises for me is "Watching the River Run." I'm not especially a fan of Loggins & Messina per se, but that one song still holds meaning. Maybe because I first encountered it at a time when I was doing a lot of emotional growing. There's something about the metaphor of the running river which speaks to me. Like time, a river flows only in one direction. Like a life, a river may flow past great wonders and also at times great monotony. And when there are sharp rocks along a river bed, the best thing to do may be to let go and trust that the current will carry you safely to your destination. If you try to hold on too tightly to any place along the river's course, the fact of its current can hurt you. Sometimes you have to leave something beautiful behind, trusting that wherever the river is going, new beauty will be there too, waiting to be found. Barb, my trip leader all those years ago, is still leading wilderness expeditions -- now in Alaska. nod and point us upwards. noisy with people in the cool of night. We are the only visitors here. Everyone else is local, a regular. I am the only woman in sight. requests for hot mint tea and a nargil. these men remind me of my father. and play, I wish my father were here. would add up to a common language. First published in The Wisconsin Review, Vol. 38, No. 1, fall 2003. Beth's drawings of mint tea and sheesha made me think back to my first trip to Amman, Jordan, in 2002. That, in turn, led me back to this poem. I wrote this in 2002 shortly after our return home. 2002 was before I had my first digital camera, so my photographs from this trip are all prints in an album -- the kind with sticky pages and clear plastic overlays. Twelve years later the plastic overlays are brittle and breaking, and some of the photos don't want to pull free from their pages. Although there were no photos from the nighttime coffee shop visit which sparked this poem, I scanned some of the best ones from the album. If you're interested, you can find them here. No one knows who these men are or why their photograph has been handed down in our family. If I had to guess, I would say that this photo is probably from Belarus, childhood home to my grandfather Isaac, a.k.a. Eppie (may his memory be a blessing). It is a tiny photo, only three and a half inches by two and a quarter inches. It was in a box of miscellaneous family photographs at my parents' house; I found it in a small envelope labeled "treasures old and new" in my mother's handwriting. Who were these men? Religious Jews, it seems clear; they are bearded and wearing yarmulkes. Then again, they don't have peyos, the sidecurls which are seen on many Hasidic or Orthodox Jews, and their beards are trimmed neatly. (Though apparently peyos were banned in the Russian Empire in 1845.) It appears that they're wearing long black coats and black kippot, though that may or may not have been a signifier of anything in that place and time, whatever that place and time were. I looked through The Family History of Alice Fried Epstein and Isaac Epstein, M.D., a volume which contains the transcript of oral history interviews conducted with my maternal grandparents. I remembered that the book contained a variety of black and white photographs, many of which were taken in Europe and date to the early years of the last century when my grandparents were young. But I didn't find either of these men in any of those pictures from early 20th-century Belarus or Prague. Every time I look at this photograph I'm drawn to the man on the left, with the white beard, who has looked up from their chess game to regard the unknown photographer. I am charmed by his subtle smile. Presumably he knew whoever was taking this picture. Maybe he was winning the chess game. Maybe it was just a beautiful day in the park and he was happy to be alive. Could he have imagined this print traveling across the ocean and surviving more than a century to wind up in my hands? I'm taking advantage of the #throwbackthursday / #tbt meme -- which usually involves posting old photos on Thursdays -- as an opportunity to write short snippets of remembrance, sparked by whatever old photo I find to post. For #throwbackthursday: a few photos from 1998, illustrating a short essay of that same vintage. As far as I can recall, this one was never published anywhere. Lonely Planet is my favorite series of travel guides. The guidebooks focus on exciting places. They're geared to the budget traveler. And I'm charmed by the fact that the series started out as a xeroxed handful of pages about the founders’ journey across Asia. The trick with Lonely Planet, though, is that you have to learn how to interpret their enthusiasm. Imagine a spectrum of travelers. At one end is the tourist who prefers posh and expensive glamour-travel. At the other end is the traveler whose hiking boots have seen the world and who has the capacity to be entertained by watching fish swim by in a small stream. (No joke; that’s one of the pastimes the Faroe Islands section of our guidebook recommends.) Lonely Planet is geared toward that second archetype. The Lonely Planet Guide to Iceland, Greenland and the Faroe Islands says of the island of Heimaey, one of the Vestmannaeyjar (Westman Islands, so named after the Irish slaves who unwittingly became their first inhabitants), that visitors normally allow themselves a day or two there, but many wish they’d allowed more. "If you have fine weather (which can include light rain, fog, or overcast skies), three days will allow time to best appreciate the place," the Guide says. We read these words as we were planning a five-day stay in Iceland at the start of our honeymoon. We decided to spend two of those days on Heimaey. We woke around 5:30 to take a small plane from the tiny domestic Reykjavik airport to the tinier Heimaey one. (Getting up early was no problem, given that the sun had never set.) As we approached the island from the air, everything on its small teardrop shape was visible: at one end, the cross-shaped single airstrip; at the other end, two volcanoes, the harbor, the colorful roofs of Heimaey town. When I traveled to San Antonio over the summer I brought back a bag of old photographs, which I am slowly digitizing, a few at a time. Many of the photos are undated, so I have to guess at when they were taken. This one, though, says "1977" on the back. I'm grateful for that piece of metadata. It tells me that in this picture, I am two going on three, and my mother is only a couple of years older than I am now. This was taken in the backyard of my childhood home. That house was made of limestone, with a roof made out of red clay tiles in the Spanish style. I remember that gate around our swimming pool, and I remember the little sculpture of a turtle (visible, though blurry, in the bottom right-hand corner) which had been shaped around a pipe, so that water could be made to spray into the pool out of the turtle's open mouth. Some years later, when I was a decent swimmer and it was safe to take the railing down, my parents replaced the pebbled concrete around the pool with red bricks. And eventually the turtle too went away, though the little fountain remained. I think I insisted on keeping the turtle in the secret hideaway I constructed in the small space between our backyard and the backyard of our next-door neighbors. But none of that had happened yet when this photo was taken. So many of the experiences I think of as having been formative hadn't happened yet when this photo was taken. At two there's an inconceivable amount of growing and changing ahead. My mother, in contrast, was already recognizably herself when this photo was taken. She had been a mom for years; she had already grown into the adult she intended to be. Of course there were decades of adventures ahead for her, too -- but I think nothing is as extreme as the changes we undergo as kids. When I look now at photographs of myself as a child with my parents, I'm conscious of being a link in a generational chain. It's fascinating to imagine our son, when he is approaching forty, looking at photographs of me holding him when he was two. What will he see in the expression on my face, the way I look at him, the way we are together? What will he remember of those early years of stubbornly insisting "I do it," climbing and running and falling, playgrounds and sippy cups? I'm taking advantage of the #throwbackthursday / #tbt meme -- which usually involves posting old photos on Thursdays -- as an opportunity to write short snippets of remembrance, sparked by whatever old photo I find to post. I can't guarantee that I'll do this every Thursday, but I'm enjoying the practice so far. My maternal grandmother; her two daughters; three of their daughters, including me. Sometimes I wonder: what stories will our son tell about his growing-up, in years to come? How will he remember his childhood? What memories will he seize onto and hold fast amid the swirl of all the other memories which wash away? Sometimes I can't believe that he won't remember much of these early years. How can it be that he won't remember last night's potluck dinner in the synagogue sukkah, sitting at the kids' table, singing along with the Shabbat blessings, and then whooping and laughing while playing tag with the other kids in the deepening dark outside the sukkah which gleamed with strings of little lights? And yet I don't remember much about being five, much less the years which came before it. My fifth birthday party was a dress-up party at a fancy restaurant called the University Club, at the top of one of the few tall buildings near our neighborhood. I remember dressing up in one of Mom's blue dresses -- made of crinkled chiffon, I think, or something like it -- and wearing a big strand of her pearls and a floppy sun hat. I remember that she asked if I wanted to pierce my ears to surprise my father, but I wasn't ready to do that, so we got me clip-ons instead. I remember the scratchy gold ribbon which held the high heeled shoes on my feet. Do I remember this because there is a Polaroid picture of it and I've had that photograph to remind me in the interim? Am I remembering a memory of a memory? I must have been attending the Judson Montessori school then, in the old church building just around the corner from the Pontiac dealership. I remember painting at an easel, doing math with sticks which represented tens and hundreds, looking at a timeline made out of felt which depicted the earth's history. (Most of it was black, denoting the time when the earth formed and cooled. Then there was green for the time when plants arose, and yellow for the dinosaurs, and human history was represented by a tiny nubbin of red felt at one end.) I remember eating meals there while listening to Ravel's "Bolero." I remember coming home and throwing tea parties with my miniature set of rose-printed china, filling the tea cups with Bosco-flavored chocolate milk. A basically happy childhood blurs together in memory. We remember the unusual moments against the backrop of undifferentiated normalcy. (Take the winter of 1985: I remember the "San Antonio blizzard of '85" which dropped thirteen inches of snow on my hometown, and I remember my middle brother's wedding the week of that blizzard, but the rest of the season is lost to me now.) As we age, it seems, our more recent memories are stacked on top of the pile and the oldest memories compress like flakes of soft snow packed over centuries into glacial ice. What would it take to find those memories again? It's funny how memories come back at unexpected moments. The feeling of bobbing in the warm waters of the Guadalupe, lifejacket and waterskis keeping me afloat, with the bright woven ski rope threading through my hands as the boat idled forward. The big plants at the waterside, which we called elephants' ears; how green pecans stained the water and our hands; how we used to chase cottonwood fluff when the wind blew it across the wide-bladed St. Augustine grass. Packing up the Suburban for two weeks at the lake house: coolers full of groceries, suitcases, our Siamese cat in his carrier yowling until I inevitably set him free and he marched across the dashboard (much to my father's chagrin.) The old songs Mom taught me -- "The Ladies in the Harem of the Court of King Correcticus" and "As I was walking down the street a billboard caught my eye..." The convenience store (was it in Seguin?) where we used to stop to get whorls of the hard spicy sausage which hung behind the counter. The scavenger hunts my mom used to organize for my friends and me; I remember holding a sheet of paper marked in her neat curving handwriting, wandering around together in search of -- what, I can't recall, but I know we were successful. Climbing down the aluminum framed ladder into the river in front of our house. How my toes shied away from slimy lilypad stems. Making homemade raspberry ice cream, turning the hand crank; how the end result was brilliant pink with the berries' separated druples. Growing a small garden one year -- I couldn't resist picking an ear of corn before it was ripe, and hiding in my secret wilderness place in the unsold lot next door where no one would see me nibbling its sugar-sweet kernels. The thwock of tennis balls against rackets as Mom and Dad played doubles, resplendent in all white, on the court at the Ski Lodge. Walking with Mom to pick Indian Paintbrush and cornflowers to bring home and put in a jar on the table. Pyrex casserole trays of King Ranch Chicken. Evening boat rides, my father's hair windblown, sitting on the back of the boat and watching the houses and boathouses and limestone cliffs along the river rush by. Early morning boat rides, the river and lake still as glass, perfect for cutting slalom paths in and out of our boat's wake. Venturing down our street with a friend, aiming for patches of shade because the asphalt was hot beneath our bare feet, and then down the boat ramp at the end of the block to float down the river in lifejackets back to our own pier. Playing games of rummikub with mom and friends on the square formica table, pieces clicking and clacking beneath our hands. The taste of the "special" nachos at the Ski Lodge, made with spicy queso. The orange blossoms my parents ordered there sometimes at the bar. Catching fireflies on hot summer evenings, putting them in jars with perforated tinfoil on top, then letting them go. The pale yellow moths, redolent with dust the color of hardboiled egg yolk, which beat their wings helplessly against screen doors. The zzzzt of the bug zapper at work. Swinging in the hammock, endlessly. The two flavors of Bluebell we used to get at that Pic-n-Pac (Cookies & Cream, and Pralines & Cream), and the treat of scooping curls into beige melamine bowls and enjoying them at night before bed. Watching the Ski Bees show at the Ski Lodge on Thursday nights, pyramids of women on each others' shoulders, followed by brave and crazy barefooters like my brother. On the Fourth of July, after the ski show, lying back to watch the fireworks exploding brilliant against the Texas sky. Photo: an old postcard of the swimming pools at the Lake Breeze Ski Lodge in McQueeney, Texas, sometime before they put up the diving board and high board I remember. Photo by kimonomania; found on flickr. My favorite moment is when I settle in to the shampoo chair and tip my head back into the sink and close my eyes. The sounds of conversation wash over me. There's something physically delicious about it: hands working shampoo and conditioner into and out of my hair, massaging my scalp. But there's also something emotionally satisfying about it, too, for me. Feels like comfort. 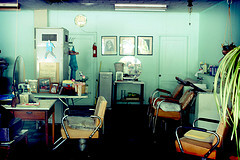 I used to go with my mother to the beauty parlor on Olmos. I don't think the place exists anymore. While my mother had her hair done I would draw pictures, or link piles of brightly-colored curlers into long chains. I made dragons out of curlers. The women who worked there must have been very patient. I don't ever remember them getting annoyed with me. Maybe it was fun for them to have a nutty little kid around. My grandmother used to go to the beauty parlor every week. There was a lady who ran a small private beauty shop out of her house; there she would get her hair set beneath one of those ubiquitous bubble-dome dryers. In my memory her manicured nails were always mauve. I think the beauty parlor was one of the few places my grandmother used to drive, back when she still drove: in her big white car with the black bench seats. It smelled like leatherette and tic-tacs. When I settle in to have my hair washed, I always think "there should be a bracha for this." (I have the same thought on the rare occasions when I spring for a pedicure, usually right before going to Texas, or on the first warm afternoon of early spring when I can't stand wearing heavy boots one day longer.) It's something I do just for myself, and I want to savor it. Is it silly to think of my haircut appointments as "self-care"? They do leave me feeling cared-for. I always feel a little bit sheepish once my hair is cut, when the stylist asks whether I use mousse or gel at home when I blow my hair dry. I'm too low-maintenance for any of that; I don't even own a hair dryer! I wonder sometimes whether the stylists get together and roll their eyes at people like me. But I love hearing the snick of the scissors, watching the small curls collect on the plastic smock. When I step outside, my head always feels so much lighter, even if she only trimmed an inch or two away.